Kwame Nkrumah (21 September 1909 – 27 April 1972) was the first President of the first free nation in Africa, and a founding father of the Pan-Africanist movement. His dream was to turn Ghana into a modern industrial utopia – a society shaped by the power of science that would serve as a model for the rest of the African continent. At the heart of his plan was the Volta Dam, a hydroelectric power plant that would provide Ghana with all the cheap power that it would need to initiate an industrial revolution. In 1935 Kwame Nkruma left Ghana for the United States as a student, receiving a BA from Lincoln University, Pennsylvania in 1939. During that time, he was elected president of the African Students Organization of America and Canada. He was also exposed to the philosophy and teachings of Marcus Garvey, and the Communist teachings of a US based Trotskyist intellectual cohort. Nkrumah later credited these ideas with teaching him ‘how an underground movement worked’. With the threat of uprisings abroad and financial crisis at home, Britain reluctantly set Ghana free on March 6, 1957. Nkrumah easily won election as the country’s first President, and chose a flag with the Black star –inspired by Marcus Garvey’s Black Star Line – at its center to represent the new nation. Nkrumah also launched a series of popular social projects on behalf of his people (who loved him), including The Organization of African Unity (OAU). The OAU was established on 25 May 1963. One year later, Malcolm X established the Organization for African American Unity (OAAU) modeled after Kwame’s idea. If Ghana was to become a modern industrial nation, it needed both industry and the power to fuel that industry and provide the continent with its first industrial revolution. The Volta dam was originally the brain child of Britain, but the colonial power was shrinking from the world stage and in doing so, began to withdraw its financial and project support from its former colonies. During his campaign, Nkrumah’s platform was founded on the idea of modernization, but without funding for the Volta river project, there was no way that dream could become a reality. Second, the worlds energy prices were raising, and having access to a cheap source of electricity with which to process aluminum would have greatly increased the profit margins and reduced processing costs for the manufacture of the metal. President Eisenhower contacted California based Kaiser Aluminum, the world’s largest aluminum manufacturer, to exploit the opportunity and fund the project. The assumption that America would mine Ghana’s bauxite and use the Volta dam’s electricity meant two new large income streams and industries that would assure Nkrumah’s dream of an industrial revolution. However, Kaiser Aluminum had different plans. They would only use Ghana’s cheap electricity – importing aluminum ore from other places in the world, and then exporting the aluminum back to America. The thought was that if the operation became too profitable, Nkrumah could nationalize the dam project and cut America out completely. The exploitation of Ghana went into full swing; it became a haven for American and European industrialists who were interested in taking advantage of the country’s desire to modernize. White corporations would repeatedly dupe officials into purchasing whatever could be sold, no matter how inappropriate (a Belgian company sold the country snow plows¬. Yea, snow plows. In Africa). After the coup, the once wealthy nation of Ghana was milked dry. Kwame fled in exile to Conakry, Guinea never to return to his home country. After 19 years of prosperity under Nkrumah, Ghana slid back into the dark ages. After the coup, the Kaiser Dam project flourished, continuing to make payments to the World Bank and continuing to yield dividends to its parent corporation. The people of Ghana saw almost none of the benefit. Instead, the people got one military coup after another (7 total). 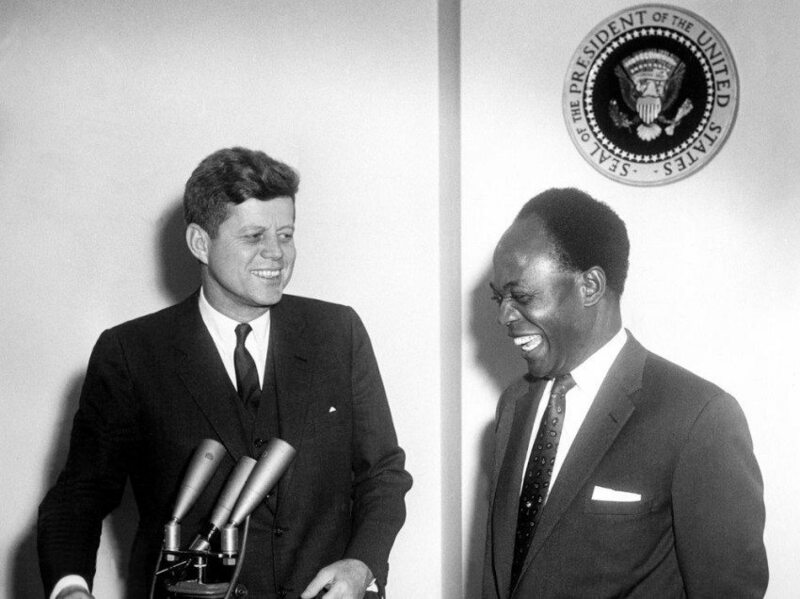 In the 1950s, the world celebrated Nkrumah and Ghana. After the coup, the American propaganda machine painted the country and its leader as corrupt, savage, and unstable. Kwame was called “the Communist Messiah” and Africa was said to be “unable to handle the pressures of modern industrialization. Kwame Nkruma’s organization was hijacked by the United Nations, and is now a tool used to expand the program of African exploitation. wame Nkrumah died of skin cancer in April 1972. He was 62 years old. He was survived by Gokeh, Samia Yarba (who recieved the 2006 European Parliament Award for Journalism), and Sekou Ritz Nkrumah. Over his lifetime, Nkrumah was awarded honorary doctorates by Lincoln University, Moscow State University; Cairo University in Cairo, Egypt; Jagiellonian University in Kraków, Poland; Humboldt University in the former East Berlin; and many other universities. In 2000, he was voted Africa’s man of the millennium. So who was Kwame Nkrumah? He was Africa’s Malcolm X. He was a true and benevolent leader and martyr. He was a visionary upon whom the hopes and dreams of a continent and a Black world rested. And he was a victim of the United States of America, capitalism, and the same program devoted to the destruction of the Black race that is still in existence today.